There are plenty of business ideas for women entrepreneurs in Bangladesh; even a woman can start a small scale manufacturing business as well. That’s why you have a great chance to select a business, which is the best for your finances, time and education. You can succeed in business regardless of whether you’re single or have entered marriage, single mom or widow, have special needs or active. These are potentially great entrepreneurship ideas for women around the world and also suitable for the women in Bangladesh. As it’s the age of the internet, everything has become easy and simple, business for women as well. Also, online businesses are getting boomed across the world. Besides, we’ll recommend an online business for women if you’re looking for something stable and high return business. What are the Top 10 Best Business Ideas for Women in Bangladesh? As the best thing about the best business ideas for women is that need little to no investment, you can start them at home. Also, you have to best possibility to get the immediate returns in most of the ideas. It’s the internet that made everyone to enter the business. This is because large numbers of women enter into business these days. Although the gender divide over income between men and women continues, it’s easy for women to do business nowadays. 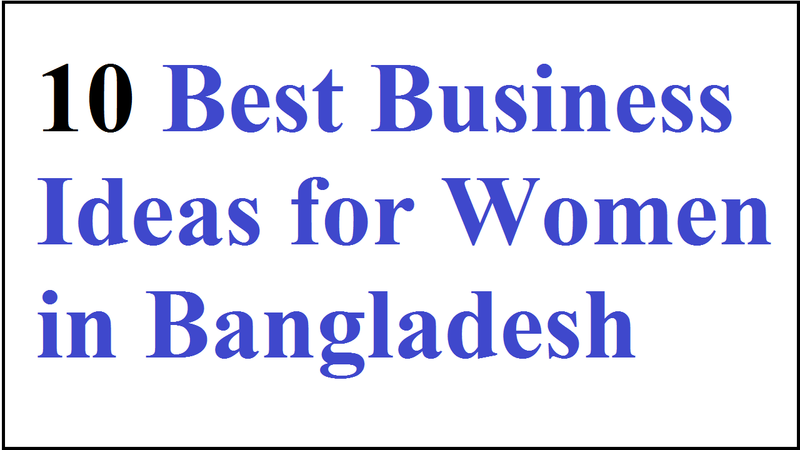 So, let’s know about the top 10 best business ideas for women in Bangladesh. You do yoga every day or even you want yourself to be fit if you have this knack for being healthy. But, you can make a business out of it by teaching this art to others. As there are so many women out there who are so busy in their lives that they don’t focus on their physical fitness, Yoga business is booming today. As some of our community members doing in their locality, you can teach them. This is the hottest trend of the freelance writing business, which is one of the best business ideas for women in Bangladesh. This is because it’s easy to start and you are not bound to relocate or do your work during office hours. What you need is an ability to draft your thoughts in a flow around the topic you are writing for. Because this can be learned freelance writing is easy and writing is indeed an art though. Also, as you will be paid less, initially you’ll have to focus more on your craft. And you can get any amount you ask for when you become a better writer. The trend is fast catching on when women are building their clothing business. This is not funny because there are so many talented women out there. When they’re designing their own clothes and setting up space in their homes to stitch them, there’s nothing stopping them. So, quite a few women are turning this talent into a business from home with a little bit of investment. It’s the type of business for women, which never goes old. There’s nothing stopping you from becoming a food entrepreneur if you’re a woman who loves to cook. So, if you can cook or bake anything you like the world is your oyster. What it takes is word of mouth. As it runs from a house by a lady whose family supports her business, there’s this place we order food frequently from. This is because that’s always fresh and her little home restaurant is quite popular when they make the most amazing home cooked food. Many women are taking their years of corporate or IT experience and turning it into full-fledged businesses moving away from the ‘traditional’ business options. There is a crying need for experienced and senior ex-leaders with whom they can consult for a variety of challenges. As there is a lack of women consultants, this is one of the best business ideas for women in Bangladesh. You can venture into the world of graphic designing and turn it into your own business if you have the flair for business and a creative mind. Also, the offers will start pouring in when you create your portfolio and establish yourself as a person of repute. This is one of the best business ideas for women at home with your creative mind and skills. As people don’t have time to actually visit a counselor anymore, counseling is a serious business. A virtual counseling session will be convenient for you with tough work schedules. What the most important here is you can set your own working hours, days and schedules. If you’re qualified housewives, this business idea would be most suitable for you. How you present yourself is a matter in this fast-paced and competitive world. The business of Image Consultancy is fast catching on and it doesn’t make a difference whether you’re a man or a woman. You got yourself a business idea there if you feel that you have the flair to help develop someone’s personality and build some confidence in them. So, you’ll find always the scope for improvement for you. You could consider becoming a financial advisor if you have made good financial decisions for your family and your advice has helped your friends. You can do the business with freedom of setting up meetings at home or schedule home visits for your clients. What you have to do for this make a few business cards and pass them around. And soon you’ll hopefully see an increase in appointments when you’ll leave a couple with your clients. If you have the training and the certifications, it’s one of the best business ideas for women in Bangladesh. It has the flexibility to work to conduct physiotherapy sessions at home or visit people. As many Senior Citizen Women prefer to get their physiotherapy done by Female Physiotherapist, it’s a great prospect of the business. This is the area where you could build your monopoly in.